Dreamings Mimi (mimih) spirit figures, Nawurra spirit figures, Yawk Yawk spirit figures, stories from his father's country at Djalbangurr, from his mother's country at Kudjekbinj and sometimes from his grandmother's country near Manmoyi, including the Nawurra story. Djawida was born in the bush on his father's country at Djalbangurr in Western Arnhem Land, and is regarded as one of the finest artists in Western Arnhem Land. Djawida’s work is much sought after because of its traditional aspect and dramatic quality. His family eventually moved into Oenpelli where his mother and father worked as buffalo skinners and salters. Djawida went to school in Oenpelli and grew up in the area. Sometimes the family visited their traditional country and it was on those trips that Djawida became interested in painting. He first started to paint on rock, copying existing rock paintings, especially animals and Mimi spirits. Djawida was taught to paint by his father who painted on the rocks in the Stone Country. He then taught himself how to mix ochres and paint, eventually moving to painting barks, and in the last few years, to Arches paper. He also makes spears and didjeridus. Djawida paints stories from his father's country at Djalbangurr, from his mother's country at Kudjekbinj and sometimes from his grandmother's country near Manmoyi, including the Nawurra story. Djawida lived in a very isolated camp called Gudjekbin, in the heart of the Stone Country of the escarpments. He had no children, and therefore his stories and clan designs have not been passed on. 1985 Joint Winner major prize - Painting in Traditional Media (Peter Stuyvesant Cultural Foundation Award) 2nd Telstra Aboriginal and Torres Strait Islander Art Award, Museums and Art Galleries of the Northern Territory, Darwin. 1984 - The First Telstra Aboriginal and Torres Strait Islander Art Award, Museums and Art Galleries of the Northern Territory, Darwin. 1985, The Second Telstra Aboriginal and Torres Strait Islander Art Award, Museums and Art Galleries of the Northern Territory, Darwin. 1986, The Third Telstra Aboriginal and Torres Strait Islander Art Award, Museums and Art Galleries of the Northern Territory, Darwin. 1988, Dreamings, the Art of Aboriginal Australia, The Asia Society Galleries, New York. 1995, Twelfth Telstra Aboriginal and Torres Strait Islander Art Award, Museums and Art Galleries of the Northern Territory, Darwin. Caruana, W.,1993, Aboriginal Art, Thames and Hudson, London. 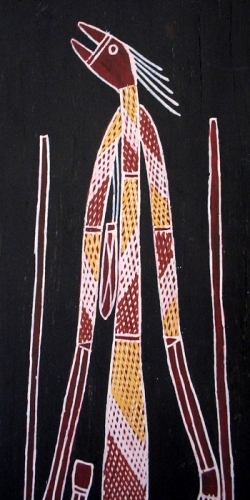 Johnson, V.,1987, Art and Aboriginality, exhib. cat., Aspex Gallery, Portsmouth, UK. O'Ferrall, M.
1990, Keepers of the Secrets, Aboriginal Art from Arnhemland in the Collection of the Art Gallery of Western Australia, Art Gallery of Western Australia, Perth. Ryan, J.,1990, Spirit in Land, National Gallery of Victoria, Melbourne. Sutton, P. 1988, Dreamings: the Art of Aboriginal Australia, Viking, Ringwood, Victoria. Wallace, D., Desmond, M., Caruana, W.,1991, Flash Pictures, National Gallery of Australia, Canberra. 1994, Kunwinjku Art from Injalak 1991-1992, The John W. Kluge Commission, Museum, Arts International Pty. Ltd., North Adelaide.